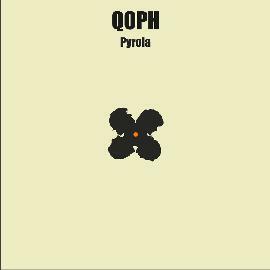 QOPH is a difficult band to describe. It is some sort of progressive-psychedelic rock. This was released on CD on the bands own label but I am reviewing the double LP version which has 3 additional tracks and a slightly different song order. One major change you will notice, if you had heard the bands debut from 1998, is that the band now sings in English and not Swedish. The LP begins with a long 10 minute track about the drummer’s trip to North Korea. This song is a long crazy journey and harkens back to tracks like Gentle Giant used to make but this band does not have a vocal approach like that. The mid section of this and most songs on the LP, the band experiment and often freakout with great jams of guitars and moog or mellotron on some tracks. The singer reminds me of Sting on this first track when he sings in the high register. Amazing song. Half Of Everything goes back to the blues roots of the band and reminds me a bit of a stranger Jethro Tull. Side B begins with Woodrose (the song that starts the CD version). It begins with a rumbling bass and mysterious feeling with flute and vocals. The heavy part soon kicks in and the band is off for another unique musical workout! Travel Candy is a stripped down instrumental tune with a guest Theremin player, making those scary ghost like sounds mixing in with the spacey guitar. Fantastic playing by the whole band. Stand My Ground, according to the biography, is influenced by Santana and the Allman Brothers. I could not really hear this except in the very cool jam in the middle of the track and the great moog synth solo. I wish this track was expanded, perhaps in the live setting. Side C begins with Moontripper, again featuring Nicklas Barker (Anekdoten) on mellotron (as on Korea) and is built on a heavy bluesy riff. The band really plays some cool stuff in the mid section of this song. Fractions is a 14 minute epic with guest moog and sitar players. Side D features the unreleased material by the band. Resh is from 1998 and probably from the debut CD sessions. It also features guest slide guitar player, Jimmy Wahlsteen. This is a pretty psychedelic song with effected vocals and hard rocking. Will The Sun Be Back Tomorrow goes all the way back to 1996 and also features Jimmy on guitar and mandolin. A very cool psychedelic blues rocker. The LP ends with Anticipations, a very cool song with a ska like riff on the mandolin. You have to check out this band. A really unique sound they create with strange dynamics and arrangements and the will to experiment. A rewarding experience! For more information you can visit the Qoph web site at: http://www.qoph.nu.